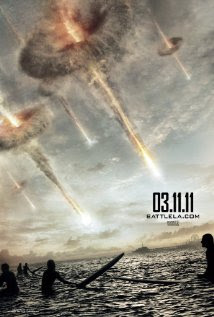 The movie was called Battle Los Angeles but expanded to World Invasion: Battle Los Angeles for the all important international market which yearn tirelessly for Aaron Eckhart, however seeing as the entire movie has to be one of the most crass attempts at recruitment for the Marines, the movie should be called World Invasion: Recruitment Los Angeles. Fighting in today's US Army just doesn't have the appeal it once did during the only 'good' war of the Second World War, when everyone was good because Hitler was so bad. Hitler was so bad he made crazy old Stalin look like an ally. These days there's all this talk of war crime prosecutions linked with the US Army alongside a deeply entrenched cultural cynicism that this is all corporate inspired war for profit anyway, so Battle Los Angeles cleans the slate on the question of immoral military behaviour by fighting an enemy we all want to kill, weird squid-like aliens. It is in pap military movies produced for the entertainment of Indy 5000000 fans that the American Military Industrial Complex most clearly spells out its messages and myths to the recruitment pool of tomorrow and those messages are, 'if you are Hispanic enroll your child into the Marines right now, and if you have sinned in the past for killing lots of people in a needless war, well someone has to make the decision to keep our country safe from weird squid-like aliens and democrats, so man up'. Marine Staff Sergeant Michael Nantz is about to resign his commission as his last mission in an undefined American war under questionable circumstances didn't go so well and there were deaths. Nantz is questioning his resolve in a moment of existential angst as he ponders the totality of his sins under the yolk of corporate merchant of death status. He's conflicted, we see him offer his final salute to the flag on his last day and say a silent prayer asking God to bless all those 3rd world nations he napalmed for American economic hegemony. Such navel gazing is thrown aside however as reports come in that a meteor strike is slowing down. The war room has bewildered military officers shocked at the news that NASA has reported these meteors are mechanical as no one in the military thought NASA could do anything useful. Game faces are put on as civilians are in danger and off the Marines go to battle an enemy not armed with weapons 5 decades old, they look frightened. It's the first time a Marine knows what it's like to be a member of the Taliban. The weird squid-like aliens kick arse as the Marines get beaten up, with Breaking News the aliens are stealing our water and invading inland, they sounded like a heavily armed Fonterra. In the Guantanamo Bay justification plot line, Marine Staff Sergeant Nantz grabs an alien and sets to work out via torture what kills the alien. Armed with a 'shoot it where it's heart would be' actionable intel taken under stress positions gives the Marines the edge to battle their way to the Hispanic civilians, the father of whom tells Nantz that he can have his son as a recruit any day. Young 'Hector' crys as Dad dies and Nantz reminds him he is a Marine now, and to bottle those tears for release on the battlefield and at home in domestic violence flash back episodes. Which is what happens. Personally if I were a taxpayer on the weird squid-like alien planet, I'd be doing my nut at the weird squid-like alien president about why our military had flown half way across the bloody galaxy to invade a planet with one great big Achilles heal like 'knock the mother ship out and the rest fall over' crap. How the hell can we master inter stellar flight but can't beat the snot out of a bunch of hominids that evolved out of monkeys who only have M-16 rifles which we are getting chewed up and spat out over? Oh and why wasn't the mother ship armoured? Come on, whoever planned this military strike has to lose at least 6 of their 8 legs over this balls up. I give it one star out of 10. Freakn legend review i cracked up! Why did you go to see this movie? No way should anyone with an sense have expected that this movie was going to be anything, apart from some B-grade Special effects dominated popcorn action movie for the 12 - 25 year young male demographic, before they went to see it. Good review. Haven't I seen this same plot before? I seem to recall an absurd plot line with a computer virus being able to penetrate a totally unknown operating system that caused a single mothership to explode? Oh yeah, that was the US Airforce recruiting. Now we just have to look forward to the US Navy. "I give it one star out of 10." I give your review 10 out of ten! - you should syndicate it.